What is Crawl Space Insulation? Instead of letting moist air out, vents bring humid air in during the summer and, during the winter, crawlspaces got colder and so did the floor above. Builders responded with insulation. One option for keeping cold winter air from the crawl space from cooling the floor above is to insulate above a crawl space. Insulation is never perfect: the joists are filled with obstructions, including ducts, pipes, cables, and light fixtures, and the presence of plumbing, cables and registers create gaps thats degrade the performance of insulation. 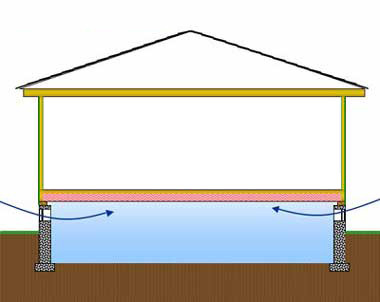 Fiberglass insulation itself is not an effective barrier. Air can pass through it (unlike some other forms of insulation). You can see this for yourself by examining fiberglass insulation that has been in place for several years. The fibers are often discolored by dust and dirt. In effect, the batt has functioned more like a filter than a barrier. Even if the insulation was effective, it often meant that air ducts would have to travel through a cold crawlspace, loosing some the heat they were supposed to deliver. Plumbing pipes became more susceptible to freezing.